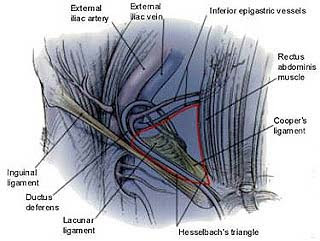 A direct hernia passes through the Hesselbach's triangle while an indirect one passes lateral to it. Medially : Lateral border of rectus abdominis. To confirm this we can do a ring occlusion test whereby the deep inguinal ring is occluded at 1.25cm above the midpoint of the inguinal ligament after reducing the hernia. Now we can ask the patient to cough or stand up. If the hernia is seen even though the deep ring is occluded it means that the hernia is of the direct type.